If you are in the market for a blow lamp there are four different designs that you should consider. They are the, standard, gardening, swivel and heavy duty blow torch. As their names suggest, each one of them is designed to be used for a specific purpose. Below you will find a review of each type of gas blow torch, what they are used for and what features they have. This type of blow torch is one of the more commonly used torches, they are the smallest ones on this list and are the most versatile version of gas blow torch. They are used mostly for small household tasks, such as food preparation, soldering, brazing and for moulding plastic pipes. Standard blow torches also have a wide range of accessories, such as flame extension pieces and deflectors, stability base and different tips. A flame extender and deflector is used to create a long cool flame that can be used for tasks such as bending plastic pipes. A stability base allows the user to have their hands free when using the torch, usually for soldering. Different types of tips can be attached to the torch for different tasks, a soldering tip for example. This type of blow lamp is used to help get rid of any weeds growing in your yard, they are designed with a long nozzle to make sure you are at a safe distance from the flame when using it. This type of gas blow torch is the largest one. And it doesn't require you to bend over to use it. To use a gardening blow lamp you simply need to sweep the flame across the ground at a distance of about 50 mm, this process bursts the cell walls of the weeds, making the dry out and die, this usually takes about 2 to 3 days, depending on he type of weed you are trying to get rid off. For example, couch weed is harder to get rid off an will regrow if the roots are still intact. A swivel blow lamp is used for the same tasks as a standard blow torch, the difference is that this type of blow lamp has the ability to rotate 360 degrees. Which is done for the purpose of redirecting the flame without having to move the torch itself. It has the ability to rotate 360 degrees both clockwise and anticlockwise allowing for better mobility and access to hard to reach places such as when working under a sink. Also, swivel blow torches can use different types of gas canisters for different temperatures, whatever the desired effect might be whether for a soft solder or light brazing. This type of blow lamp is capable of reaching the highest temperatures from all the other torches. They are used for brazing hard material such as silver, which makes them best suited for pipe bending, aluminium welding and hard soldering. 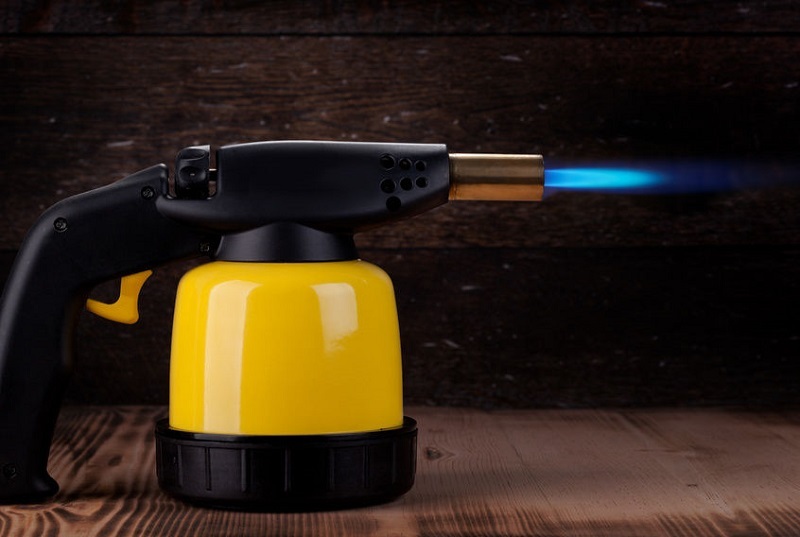 Also, the heavy duty gas blow torch is the only torch that can use propane methyl acetylene propadiene gas canister, this is what allows them to reach a high enough temperature for brazing.